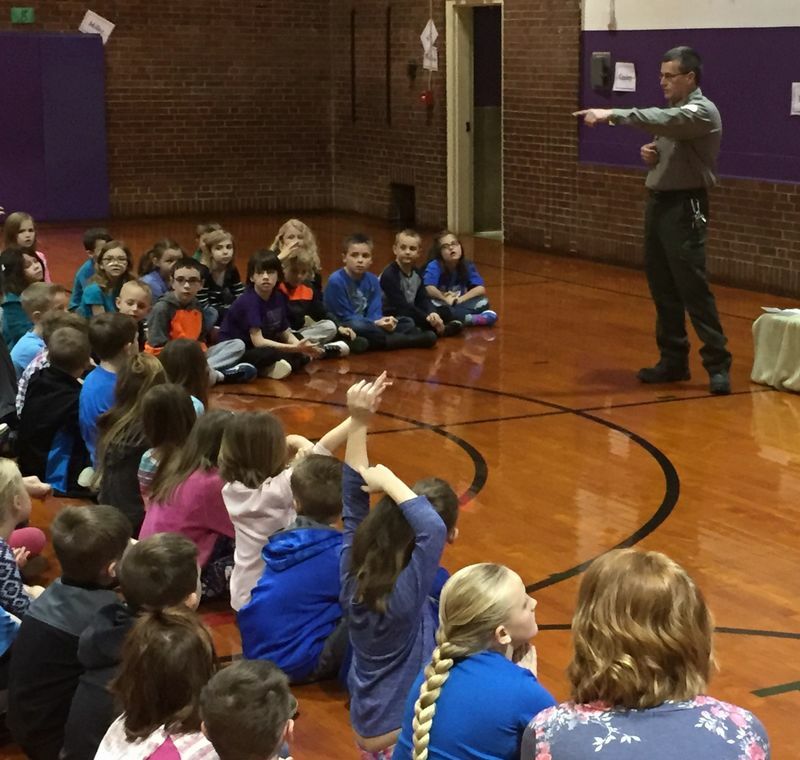 On Tuesday, April 3rd, Lee Mitchell, Natural Resource Specialist with the Army Corp of Engineers, addressed (k – 3rd) students regarding CURIOSITY. Lee has extensive education with a degree in Forestry as well as a degree in Biology. He has experienced nature in (46) states as well as does some private consulting regarding managing natural resources. Lee is invested in the natural resources around Lake Shelbyville as well as the community. Lee began his presentation like an informal conversation “with” the students versus “to” them. 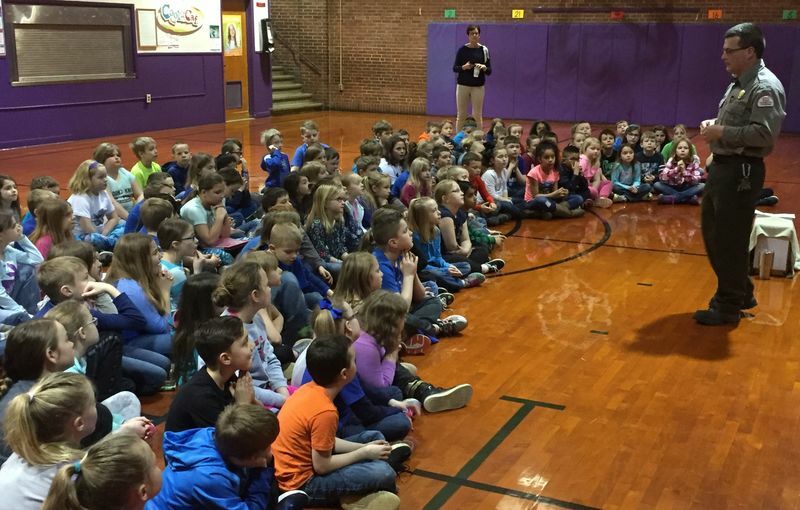 He asked the students, “What do you think curiosity is?” He called on students for a variety of answers from “being curious” to much deeper responses such as “questioning everything.” He knew the students would be curious about him and what he does as he was in uniform. The students did suspect he was a Park Ranger. The more interesting thinking and responding were in relation to what he did for his job and where he worked. The students thought he worked in the woods, cabins or the Shelbyville Visitors’ Center. He told them that all of these were correct. The students thought he kept animals safe, the forest clean and taught people about nature. He told them that all of these were correct as well. It was very interesting listening to some of the projects and roles Mr. Mitchell has managing Lake Shelbyville and the forest. I did not think about “controlled burning” to help keep the forest healthy. He is part of creating ecosystems for fish and even introducing species of fish such as Sauger which is similar to Walleye. He noted that this was to attract fisherman to our lake and add to the tourism economy with money flowing into our community. He discussed his interest and passion in his career and commented on the fact that we need people interested and curious about many topics such as the mechanics in town or teachers. Lee had a box covered for the entire presentation and did not acknowledge it until the very end. He knew the students would notice it and be curious and engaged. He was right. The students couldn’t wait to ask questions and make inferences and predictions for what could be inside. 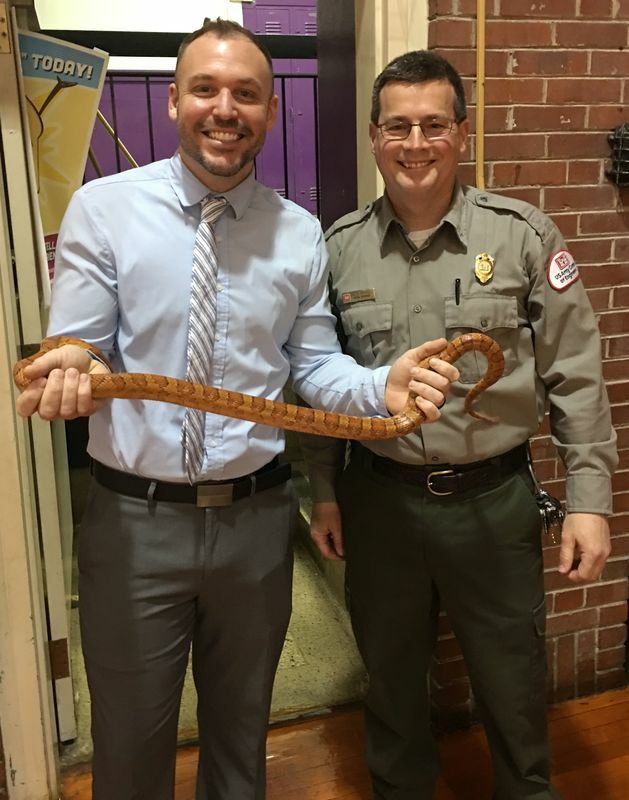 Mr. Mitchell had a ten year-old Corn Snake named, Copper. Mr. Mitchell answered questions and asked questions. “What do they eat; why do they shed their skin?” The students did get a chance to actually touch the snake if they wanted to which highlights what Lee has identified as his favorite Learning style: “hands-on.” Main Street & Kindergarten Center would like to thank Mr. Lee Mitchell again for his time and wisdom. The students really enjoyed it and it was a great message.